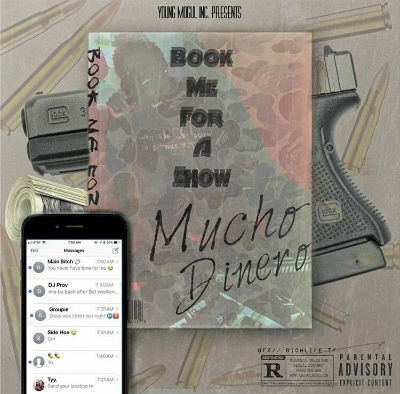 Book Me For a Show is a brand new solo mixtape from Erie, PA based artist, Mucho Dinero. At 11 tracks, the listener is sure to get their time/money’s worth out of this release. It comes jam packed with all sorts of flavorful jams like Day 1 and No Snake Zone. What jumps out at me about Mucho Dinero is that he has a distinct sounding voice, which will make him recognizable. He’s soft spoken and has a laid back delivery, but the actual tone of his voice is very unique. A lot of indie rappers sound almost exactly the same as one another, but I really can’t think of another rapper that sounds quite like Mucho Dinero. That is something that works in his favor. I’ve reviewed quite a few mixtapes before which had featured multiple artists, and it can be difficult to tell the who’s who and what’s whats. That’s not the case on Book Me For a Show. The pacing of the songs is somewhat varied. The opening track, Have Ya is chill and subdued, almost coming across like spoken word poetry at times. Other tracks like 2 More are a little more peppy and fast paced. Anyway, this release should definitely be enough to get this dude booked for some actual shows.